This polypropylene light duty scrub brush is made to be used with our 13 inch rotary floor scrubbers listed below. 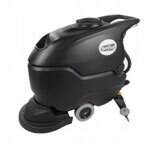 It is a light duty option that is great for everyday maintenance scrubbing of any commercial tile. Will not harm or remove finish from any surface that can be scrubbed. 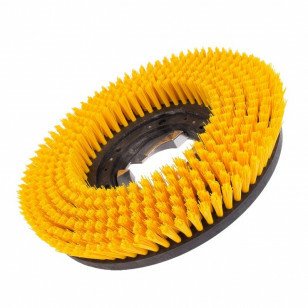 All of our polypropylene rotary scrubber brushes feature a .028" diameter fill material throughout the entire block, with 1.5" bristle length. Perfect for use in schools, retail settings, and medical facilities due to it's soft bristles. All of our rotary floor buffer brushes come with the same universal clutch plate that will 95% of the floor buffers out there. If you have a unique machine with a proprietary clutch on it, or are not sure if this brush will fit your machine, please give one of our experts a call at 855-242-9029.